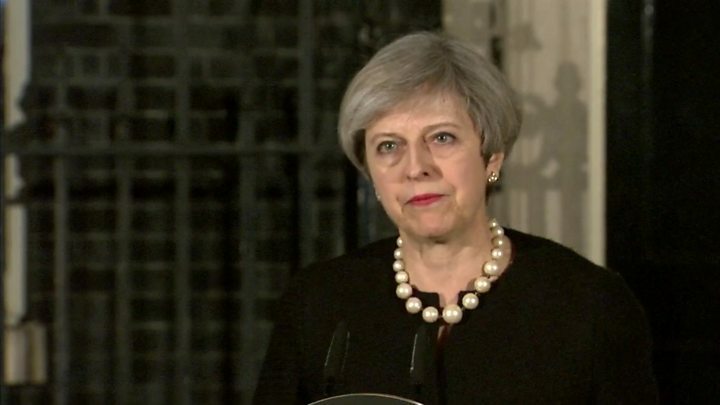 Media captionTheresa May: "We will never give in to terror"
The terror attack in Westminster will not stop Britons from going about their lives and such attacks are ultimately "doomed to failure", the PM has said. Theresa May said the "sick and depraved" attack in Westminster, in which five people died, would not stop people going to work as normal or Parliament from sitting on Thursday. Values of freedom of speech, liberty and democracy would prevail, she said. She praised the "exceptional bravery" of the police officer who died. Speaking outside No 10, Mrs May - who earlier chaired a meeting of the emergency response committee Cobra - said her thoughts were with the officer's relatives and those others who had been killed and injured in the "appalling incident". "Our thoughts and prayers go out to all who have been affected - to the victims themselves, and their family and friends who waved their loved ones off, but will not now be welcoming them home," she said. "For those of us who were in Parliament at the time of this attack, these events provide a particular reminder of the exceptional bravery of our police and security services who risk their lives to keep us safe. "Once again today, these exceptional men and women ran towards the danger even as they encouraged others to move the other way." While the details of the incident - in which a single alleged assailant in a car struck a number of pedestrians on Westminster Bridge before stabbing a police officer at the gates of the Palace of Westminster - were still emerging, she said, the UK would not be cowed. Confirming that the terror threat level would remain at severe, she said it was no accident that Parliament had been targeted in the incident. "These streets of Westminster - home to the world's oldest Parliament - are ingrained with a spirit of freedom that echoes in some of the furthest corners of the globe," she said. "And the values our Parliament represents - democracy, freedom, human rights, the rule of law - command the admiration and respect of free people everywhere. That is why it is a target for those who reject those values. "But let me make it clear today, as I have had cause to do before, any attempt to defeat those values through violence and terror is doomed to failure." Parliament, she insisted, would meet "as normal" on Thursday and the British public would "come together as normal". "They will board their trains, they will leave their hotels, they will walk these streets, they will live their lives. And we will all move forward together. Never giving in to terror. And never allowing the voices of hate and evil to drive us apart." 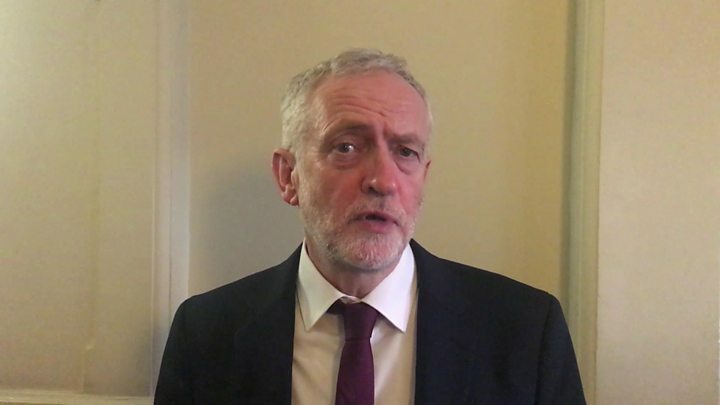 Labour leader Jeremy Corbyn has also paid tribute to the police and emergency services for their response to Wednesday's attack. "Lives have been lost and people have been seriously injured," he said. "I want to thank the police and all the security services who did so much to keep the public, those who work in Parliament and MPs safe. "Our thoughts are with those who suffered loss and those that have seen terrible injuries this afternoon." Lib Dem leader Tim Farron said it had been an attack on British democracy, while the Scottish First Minister Nicola Sturgeon has spoken of a "sense of solidarity" felt in Scotland for people in London.